Imagine all your dirty dishes and cutlery getting clean while you rest, watch tv or do your favorite activity. Sounds so relaxing right? But it is really possible to make this dream come true by getting yourself a best dishwasher. And to help you in search of your best model, we present you best of the best portable dishwashers on amazon. The reason why we specially wrote about portable and countertop dishwashers is because of their low price. Not only they are cheap but they deliver excellent performance and posses capacity to clean good amount of dishes. Another benefit of buying a portable dishwasher is its ability to shift it from one place to another. Especially if you own a RV, a portable dishwasher will literally benefit you. Also compact size and light weight of portable units makes them great choice for small spaces. People living in dorms or small apartments always select devices which are mini and powerful which is very obvious. And just like big homeowners, they also seek a device which reduce their work effort and provide excellent result. And to ease you work in finding a best dishwasher, we present the best portable countertop dishwashers of 2019. 1.0.1 1. How does a portable dishwasher work? 1.0.2 2. 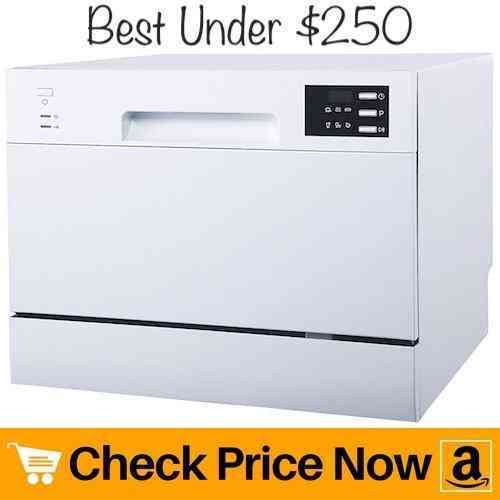 How to hook up a portable dishwasher? 1.0.3 3. What are benefits of portable dishwasher? 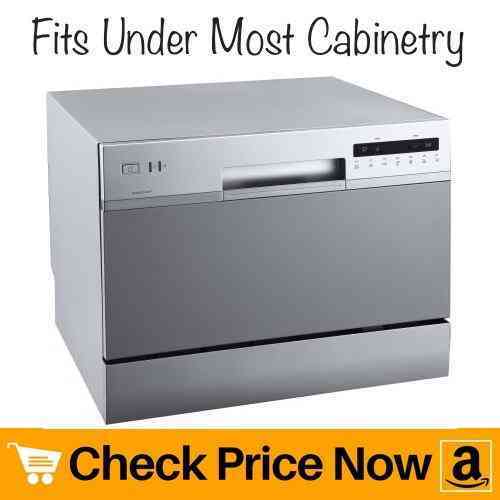 Stainless steel interior of this portable countertop dishwasher makes it stand #1 on our best dishwasher review list. Compact size of this unit needs less storage space as well as easily fits on countertop. Along with dish basket it comprises of a cutlery section wherein you can put spoons, knives and forks. Not only that, it also consists a section specially to place mugs and glasses. Therefore, despite being a small portable dishwasher it posses great holding capacity. All you need to do is, place all your dirty dishes, bowls and cutlery in appropriate racks and let this powerful portable dishwasher do its work. This small unit comes with 6 wash cycle options, each of which is for different dish-washing needs. Therefore, choose from heavy, normal, eco, glass or select speed of rinsing. Apart from that, this small portable dishwasher have an option to postpone wash cycle. Simply press the delay button present on top panel of the unit to pause the cycle. Besides that, it uses 1.14 to 3.30 liters of water depending upon the mode you choose. Also it is not necessary to connect this portable dishwasher with hot water hook-up as the unit heats water itself. As a courtesy, HomeLabs unit provides a male/female thread connector for hassle-free connection. Other accessories includes a inlet and drain hose and a faucet adapter which is compatible with round-shaped water outlet. Thus, water connection becomes breeze if you have a round-shape faucet outlet with removable aerators. Other than that, it features a rinse aid dispenser which helps to dry plates and mugs without leaving marks. To get best result every time, only make use of rinse aids made for automatic devices. Not only it provides brilliant output but cause less harm to your portable countertop dishwasher. Again we present you a small portable dishwasher with stainless steel interior from spt. Similar to above product, this SPT SD 2202s countertop dishwasher provides 6 wash cycle options. You can choose from heavy, normal, light, glass, soak and set speed of the jet. And from options itself it becomes clear what option to set for very dirty to mildly dirty plates. But if you’re a first time buyer, then do not worry as SPT portable dishwasher comes with a user manual. This user manual contains information about different washing cycles so that you can flawlessly operate device. Thus, making it best portable dishwasher for first time buyers. 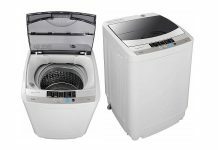 The SPT SD 2202s consists of a knob, using which you can set wash cycle. Whereas, a simple button is present to turn the device on/off or delay washing time. Further, it features a delay start of 2,4,6 and 8 hours for user convenience. A led light indicates the timer setting. Similarly, another led light turns on during absence of water inlet. And up to 6 standard place setting capacity is enough for small to medium size family. Therefore, easy operation and descent capacity makes it best dishwasher for small family. Quiet working is one another attractive feature of this SPT portable dishwasher. Apart from silent operation, the unit is small in size which makes it perfect to place on countertop. Also, the device comes with faucet adapter for quick and simple connection. Furthermore, no permanent plumbing is necessary with this unit. This in turn, makes it a best dishwasher for RV’s, dorms and small apartments. Washing plates automatically becomes much more relaxing if a portable dishwasher can fit plates of good diameter. And this EdgeStar portable countertop dishwasher posses capacity to hold plates up to 10.5 inches in diameter. Hence, this quality of EdgeStar made it rapidly popular in the industry. Along with a great space for dishes, it also consists different sections for cutlery and mugs. Overall, it provides 6 standard place setting capacity which is enough to clean good quantity of dinning accessories. And similar to above products, this unit also have a sturdy stainless steel interior which will last for years. Apart from that, EdgeStar portable countertop dishwasher is available in 3 different color. Thus, you can choose the color from black, white and silver according to your kitchen background. Its 7 wash cycle options makes this portable countertop dishwasher different from majority of the models. While 7 modes helps in perfect washing, built-in rinse agent dispenser reduces spotting on dishes. Moreover, an internal water heater in combination with powerful spray arm kills bacteria and germs present on items. This internal heater has capacity to boost water temperature up to 149 degrees Fahrenheit. So one thing you surely get on using this EdgeStar portable countertop dishwasher is, hygienic and sparkling clean plates. This edgestar model comes with a quick connect faucet adapter and 5-foot long hose to ease hook-up. In addition, low-profile of this countertop dishwasher easily fits under most cabinetry without need of permanent installation. Plus, water consumption rate stands at 2.85 gallons on normal mode. Besides, the unit uses 200 kW per year which is 61% less than that of other similar models. 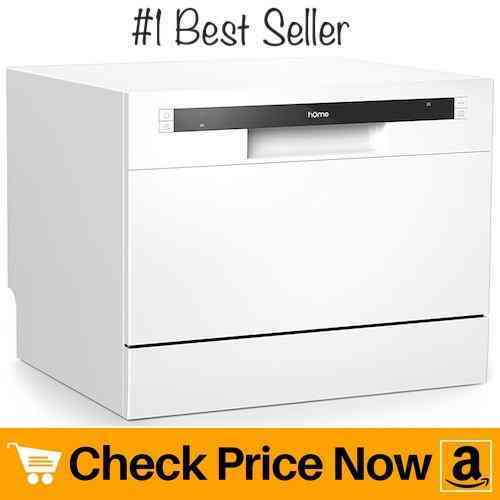 So conclusively, it is the best energy-efficient portable dishwasher on the review list. The unit provides total of 7 modes which is more than majority of models. A small portable dishwasher with great plate holding capacity reduces so much effort. So we present you Danby portable dishwasher which is compact in size but can clean so many items in one go. One of the benefit of owning such model is, you do not have to refill the device multiple times. This in turn saves water as well as cuts down cost of electricity. As a result, you save a lot of money while getting good amount of sparkling clean dishes in single wash. Furthermore, Danby portable dishwasher includes an option of intensive mode. In case, your plates are too oily or sticky, select this mode and wait for cycle to complete. At the end, all you will get is a smooth, sparkling and hygienic plates with no trace of oil. Just like most of models, this Danby portable dishwasher also offers 6 wash and place setting options. In addition to that, it also consists of a silverware basket wherein you can place items such as forks, spoons, knives, etc. This silverware basket along with great item placing capacity makes it a best dishwasher for medium to large size family. Besides, do not worry about water wastage with this compact unit. It will automatically turn off water supply even when the device is working. However, you should always maintain habit of turning off water inlet in order to increase life span of dishwasher. Now you might wonder, this portable dishwasher would be expensive as it offers so many features. But surprisingly, it costs relatively low as well as it is easy to hook-up to any tap in your kitchen. Once you set up the device, it is very easy to operate using its press buttons. Plus you get 3 delay option from 2, 4 and 8 hours. Overall, it is mini, convenient and easy to set-up unit from Danby. Temperature raise up to 148 degree Fahrenheit in combination with powerful spray jet deliver excellent water-force. This in turn also kills bacteria, microbes and bacteria present on plates and cutlery. Therefore, every time you wash plates using this portable dishwasher, you get a hygienic and clean output. Apart from that, small size of the unit easily fits over kitchen platform. Also light weight makes the device makes it perfect for RV’, dorms, boats and small size apartments. If you love travelling and like to keep basic amenities with yourself, then this portable countertop dishwasher will not fail you. It comes with a quick-connect kit, using which you can temporarily connect device to kitchen faucet. This temporary kit also drains water directly into the kitchen sink. Thus, reduces effort while making itself a best dishwasher in respect of user-convenience. Here comes another SPT portable dishwasher with beautiful exterior. Not only does it have a goof look but this compact unit is also energy-star compliant. And by that it means, the device consumes less energy while gives best results. Ultimately, it reduces electricity bill and saves money. Moreover, with this SPT dishwasher you can choose delay start from 2,4,6 and 8 hours. These are by far more delay options a unit can provide. Further, instead of setting wash cycles by knob, it provides simple buttons to choose appropriate options. You can choose washing mode from heavy, ECO, glass, normal, speed and rinse. All of these features contribute in making it best dishwasher along with beautiful exterior. LED display along with electric control further enhances overall look of dishwasher. This light indicate current mode as well as remaining time. Also, the unit also includes a water supply warning and rinse aid warning indicator. This in turn helps to know when you need to fill rinse aid or turn off water supply. In short, you do not have to remember anything as the unit itself will let you know by glowing light. Conclusively, it is a best spt portable dishwasher with digital display. A universal faucet adapter is responsible for quick and easy connection. Attach this adapter to any of your kitchen faucets and let your portable dishwasher clean your dirty plates. Furthermore, it features automatic detergent and rinse-aid dispenser to make your work more easy. All you need to do is, fill both chambers with right amount and wait till you get sparkling clean plates out from your SPT portable dishwasher. 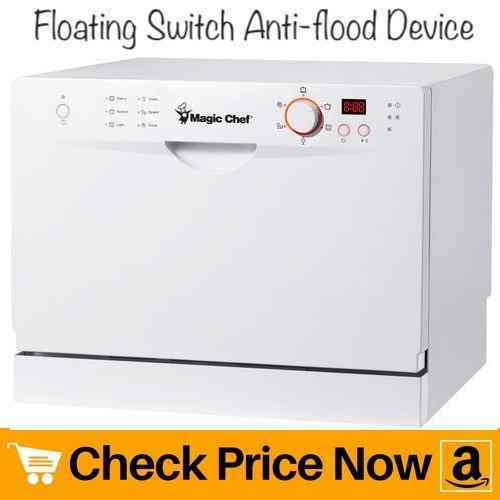 Next on our best dishwasher review list we have a brilliant product from Magic Chef. This portable countertop dishwasher have large amount of plate holding capacity. Therefore, you can clean good amount of plates in single cycle. Ultimately, it saves energy, time and water, all of which helps to saves your hardly-earned money. Especially if you’re using too many electric appliances, one thing you look for sure is its power consumption. However, this unit consumes 680 watts which is not too less or high. We cannot exactly classify it as an energy-efficient portable dishwasher but it does have great cleaning capacity. And 6 place setting have enough room to fit number of plates. A knob allows you to set wash cycle according to washing needs. You get a total of 5 modes options to choose from. Other than that, this Magic Chef countertop dishwasher features residual drying system. Therefore, it dries plates and cutlery by method of convection or evaporation as soon as cycle is over. As the process generates stream, open door of dishwasher slightly and let steam escape. Otherwise, the items will remain wet even though they receive hot air. 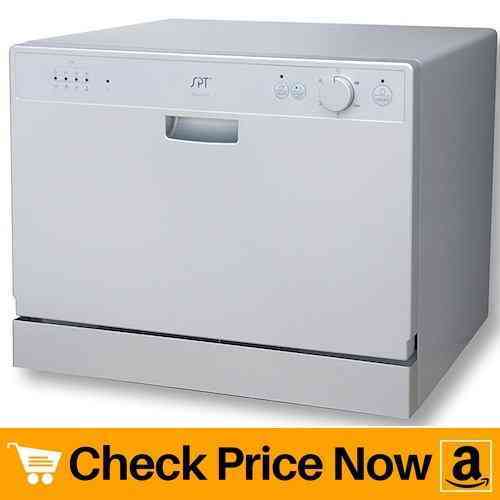 One great positive point about this portable dishwasher is, it provides excellent results even on cold water supply. Therefore, you do not have to necessarily supply hot water in order to get sparkling clean and dry plates. It works really well with cold water inlet, but can do much better if water is hot. 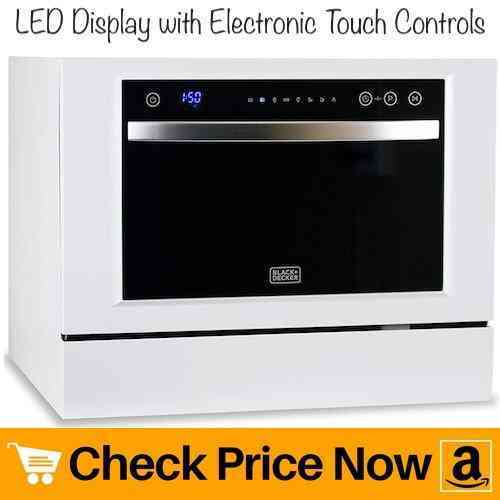 And this feature of Magic Chef makes it best dishwasher for small apartment, RV, and dorm. No color looks as attractive as black. And if you love black, then this portable dishwasher is just for you. Though it has a brilliant exterior, black color adds more beauty to whole unit. Not only the unit is good-looking but it does posses many other attractive features. One such feature of this black portable dishwasher is its easy installation. It includes everything you require for standard set-up. 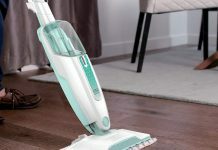 Therefore, you can get your unit running within few minutes after unpacking and connecting it properly. Apart from that, Koldfront dishwasher uses 200 Kw per cycle which is 61% less than other standard models. As a result, you can save a lot of money which you would probably pay for high electricity bills using non energy-efficient models. 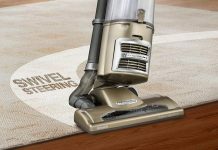 Presence of powerful spray arm ensures you get deep and through cleaning every time. Further, a rinse-aid dispense makes sure plates come out spotless. 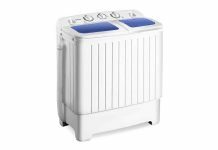 While heavy wash cycle effectively wash plates, internal heater heats up water for more precise cleaning. In addition, temperature boost up to 149 degrees F eliminates bacteria and germs. As a result, you get deeply clean and hygienic plates every time you make use of this black portable dishwasher. This portable dishwasher easily fits on countertop, tabletop or under cabinetry because of its relatively less height. In spite of having total length of 17-inch, it can easily hold plates up to 10.5 inches in diameter. Apart from that, it includes a knob to set washing modes. Turn the knob to most appropriate mode according to the washing need and get shiny bright dishes. Hence, this Koldfront unit is a best portable dishwasher in terms of color, look and ease of use. 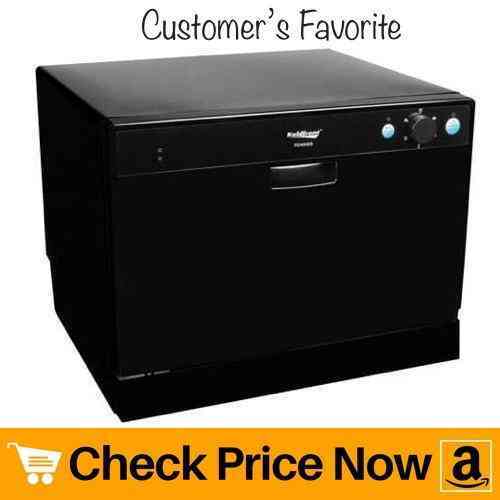 Our best dishwasher review list ends with this Black + Decker portable unit. 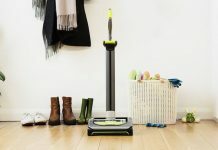 If you have kids in your house who loves to explore digital things and unknowingly interrupts working mechanism, then this portable dishwasher solves the problem. And this is possible because of its child lock feature. Not only the unit posses attractive features but it also wins heart by its exterior design. It has LED light display with electronic touch controls. These controls are very easy to understand and select by simply pressing on the button. It comes with total of 7 wash programs to select from. Therefore, select most appropriate mode from intensive, normal, ECO, glass, 90 minutes, rapid and soak. This portable dishwasher from Black and Decker is energy-start certified. As a result, it saves lot of electricity which ultimately cuts down cost of electric bill. Apart from being energy-efficient, this unit posses high efficiency rating which makes it one of the best portable dishwasher. And higher efficiency means great output. Thus, you will surely get throughout clean plates every time you turn on this mini unit. Why trust us? 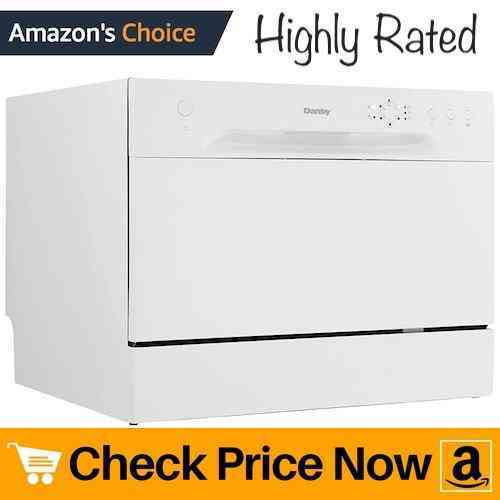 we have reviewed these dishwashers personally. HomeStuffPro spent own money on more than 15 products from Amazon.Com then reviewed it personally. Also check out our views on Food Dehydrators. 1. How does a portable dishwasher work? Main thing that contribute in proper functioning of portable dishwasher is hoses and faucet adapter. Many of the models in our best dishwasher review list comes with basic connection kit which helps you to easily hook-up the device. Secondly, spray arms are responsible for powerful delivery of hot or cold water depending upon model type. These rotating spray arms also throw out washing detergent in order to clean your dirty plates. Then after, dirty water is drained out from the machine and after that begins the rinse cycle. Finally, drying process begins which is responsible to dry the plates properly. And in order to reduce sports and marks of water while drying cycle, many portable dishwasher features rinse-aid. Rinse-aid reduces surface tension on water which in turn helps to reduce spots. 2. How to hook up a portable dishwasher? A dishwasher hook up is not as tough as it looks. Follow below steps for smooth hook up of portable dishwasher to sink. First of all, you need to loosen and remove aerator from the spout of the sink. Make sure to keep it in safe place as you will need it later after disconnecting unit. Secondly, make use of faucet adapter which comes along with portable dishwasher and fix it onto threaded faucet spout. Even if some models does not provide faucet adapter, you can buy it separately as they are cheap. If your unit demands hot water supply from sink faucet itself, you need to turn on tap and wait till hot water starts coming out. Then after, attach the hose of your portable unit into faucet spout by adjusting collar and collar ring. Turn on faucet, switch on device, load items inside unit, select wash mode and relax. 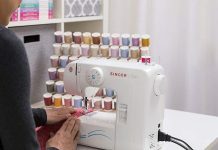 Let the mini machine do its wonder. 3. What are benefits of portable dishwasher? Portable dishwasher are becoming more famous as days are passing due to numerous reasons. 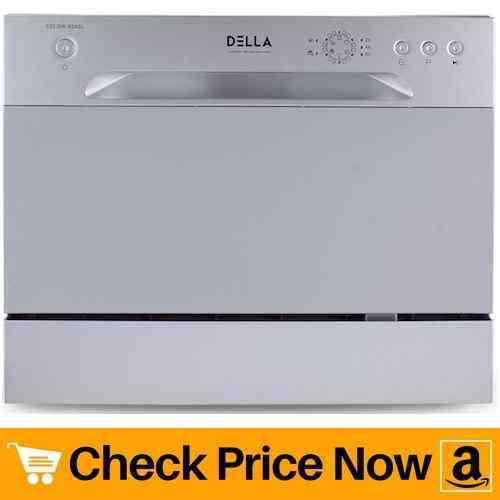 Although washing power of an in-built dishwasher is definitely high but these small units are also not less. Below are some benefits of buying portable dishwasher. Space: People living in small spaces often seek a device which works powerfully and acquires less space. And using a portable dishwasher simply solves issue of huge storage space. These kind of units easily fits over countertop, tabletop or even under kitchen cabinets. Thus, saves a lot of space. Portability: If you live in a RV, boat or on rent, you will always prefer to buy units which are easy to carry. And portability is one such factor which makes small dishwasher so famous. Hook up: Many of portable dishwasher includes faucet adapter as well as quick-connect kit to ease-up connection. Also they do not need permanent plumbing which ultimately saves your money. Clean: Cleaning a small portable dishwasher is not a work of hassle as much as cleaning an in-built dishwasher. Therefore, small size of unit is easy to clean as compared to big dishwashers. Cost: Certainly, portable units cost much less than in-built models. Average cost of a portable dishwasher is $230, whereas it goes up to $480 in case of in-built devices. Installation: You can easily install a portable dishwasher having basic plumbing skills. However, this is not always possible in case of in-built models.